Why Choose Boulder County Smiles? Ill-fitting dentures cause more problems for Boulder denture wearers than they solve. If you live with loose dentures, you probably regard them as a necessary evil. Though they certainly look better than a toothless mouth, in practical terms they leave much to be desired because they affect two essential activities: eating and talking. Unfortunately, many frustrated Longmont denture wearers have quit dining in restaurants or engaging in social activities because they are afraid their dentures will slip. Implant dental procedures at Gordon West DDS, Cosmetic & General Dentistry in Lafayette are allowing former Louisville denture patients to re-engage in life. They are stable because the implant is anchored in the bone. Your denture is fixed, it will not move around in your mouth. They prevent bone loss that typically occurs when teeth are removed. 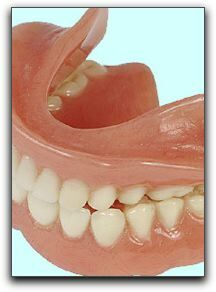 They eliminate the necessity of regular denture relines. They do not irritate gums. No denture adhesive is required. Our Louisville dental implant bone clients who have replaced their traditional dentures with implant overdentures enthusiastically say that the dental implant cost was more than worth it. Do you want to eat normally again? What is the value of maintaining your facial shape? Can you put a price on confidence? If you want more information about dental implants, call 720-862-3630 to schedule an implant tooth consultation with Dr. Gordon West. Gordon West DDS, Cosmetic & General Dentistry is located at 1140 West S. Boulder Rd, Suite 201 in Lafayette. We have been providing advanced Boulder dental care since 1998. Lafayette CO dentist Dr. Gordon West offers cosmetic dentistry, dental implants, sedation dentistry and general & family dentistry to patients in Boulder County and the surrounding areas including Lafayette, Louisville, Broomfield, Brighton, Longmont, Erie and Denver, Colorado.